If this is an emergency, call 911 immediately. If you or someone you know needs further assistance, please utilize the below bystander guide as well as community resources. 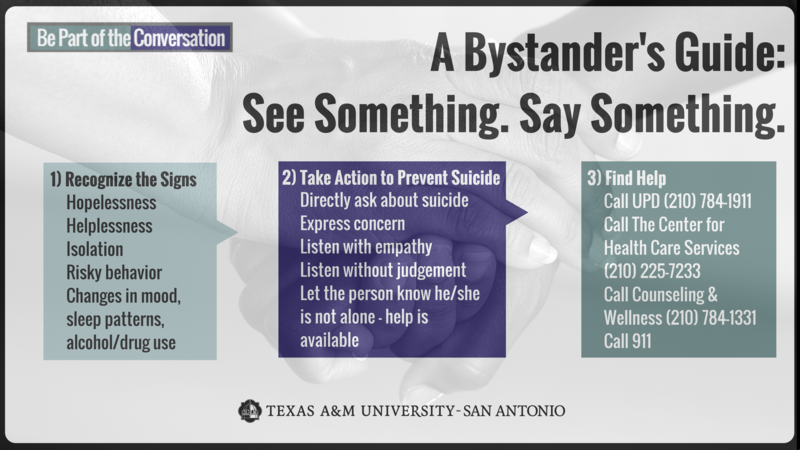 A&M-SA Office of Student Counseling & Wellness Services (SC&WS) provides a 2 hour workshop focused on suicide prevention and intervention for students, faculty and staff. Based on the topic and desire to have more trained Suicide Prevention Gatekeepers, SC&WS does invite community entities to contact our office for more information (210) 784-1331. Community members are encouraged to sign-up via phone based on space and availability of the training. SC&WS does prioritize students, faculty and staff; therefore, community entities may not receive all of the training materials. The next Spring 2019 training will be offered Wednesday, May 1 from 9 to 11:30 a.m. in Modular 101, Classroom 101A. Click here to RSVP in JagSync. Please take the time to review a short 5 minute video that highlights the warning signs of suicide, how to directly ask someone if they are thinking about suicide, and how to get a loved one to the appropriate help. This initiative is a result of a new Texas State law which requires that suicide prevention and mental health information be shared with all entering college students. Please checkout the below smart phone apps that may aid you in finding emergency resources as well as practicing healthy coping skills. There's a Smart Phone App that can help! QPR stands for Question, Persuade, and Refer - 3 simple steps that anyone can learn to help save a life from suicide. Just as people trained in CPR and the Heimlich Maneuver help save thousands of lives each year, people trained in QPR learn how to recognize the warning signs of a suicide crisis and how to question, persuade, and refer someone to help. Each year thousands of Americans, like you, are saying "Yes" to saving the life of a friend, colleague, sibling, or neighbor. QPR can be learned in our Gatekeeper course in as little as two hours. Click here to learn more about the QPR Institute. What's the purpose of QPR? SC&WS maximizes 2 (two) hours to present, discuss and role play situational scenarios until participants feel comfortable with the material. Please log-in and sign-up via JagSync: click here.